Mobile Armored Strike Kommand: Weirdest M.A.S.K. Merchandise? We are all aware of the fantastic M.A.S.K. toys, cartoons and comics. But what about all of the other merchandise that was available back in the day? A pair of M.A.S.K. Trainers/Sneekers! 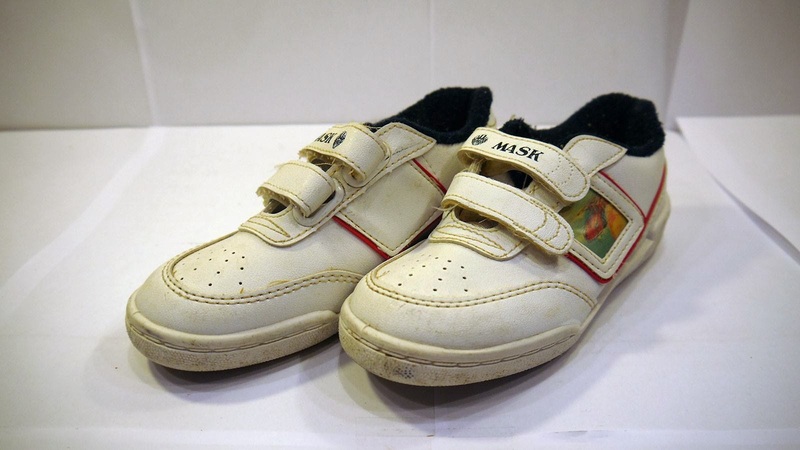 When I was younger, my Mum and Dad gave me a M.A.S.K. Soap set (I still have them in the loft I believe) and I've heard/seen other items such as Bedspreads, Party Invitations, plates, etc. So, what's the weirdest piece of M.A.S.K. Merchandise that you have in your collection? We'd like to find out - please share your images over at the M.A.S.K. Comics Facebook Page. Let's make 2014 the year that we Bring Back M.A.S.K. Make 2014 the year we Bring Back M.A.S.K. !